Gina Picetti and her two children, Gabriella and Angelo, walk to Schultz Elementary School in Delaware with Hailey and Jamie Cehres Wednesday morning during Walk to School Day. Logan Ziegler walks to Schultz Elementary School in Delaware on Wednesday morning with his mom, Shelly, and their dog, Ella. Shelly Ziegler said they try to walk to school as much as possible since Logan used to have to ride the bus to school every day. 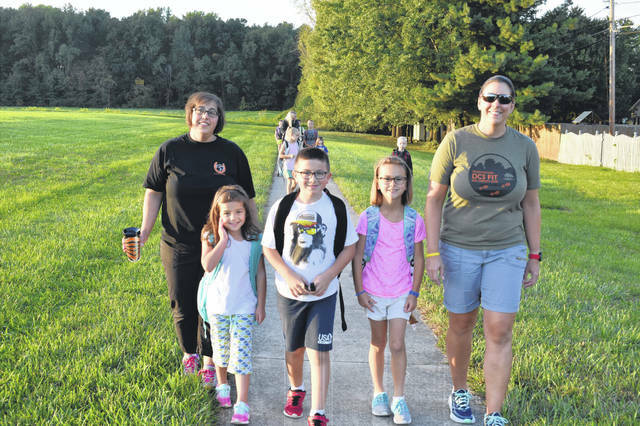 As the sun rose over Schultz Elementary School in Delaware Wednesday, dozens of students were joined by parents and a handful of pets as they walked to school as part of National Walk To School Day. Wednesday was no different for Logan Ziegler, who walks to Schultz Elementary School every morning with his mother, Shelly, weather permitting. 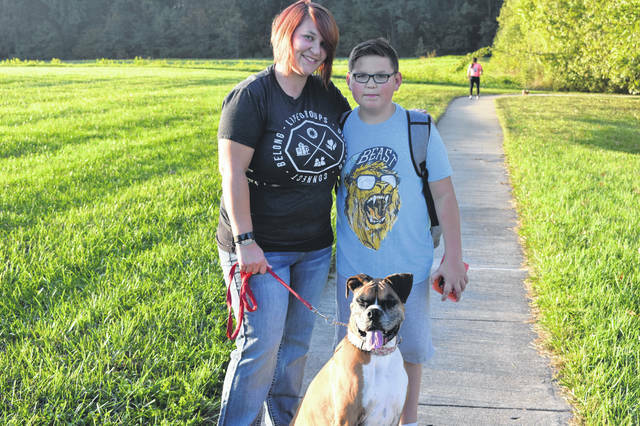 Shelly Ziegler said Logan had to ride the bus to school at their previous home, but since they moved to Delaware, they’ve walked as much as possible, bringing along their dog, Ella. Likewise, students Mansu and Suri Singh regularly walk to Schultz and had to walk along with their mother, Nicole, Wednesday because their car was in the shop. Mansu added that he enjoys the walk to school. Susan Sutherland, a community health specialist with the Delaware General Health District, said by encouraging students to walk or bike to school, it helps to reinforce children’s traffic safety skills and creates and maintains safe places for children to walk within their neighborhoods. Sutherland added that “Be Safe, Be Seen” is a great way to identify specific steps people can take to make our community more pedestrian friendly and promote the fact that children need regular physical activity to stay strong and healthy. Schultz Principal Travis Woodworth said he appreciates the message and Walk to School Day.